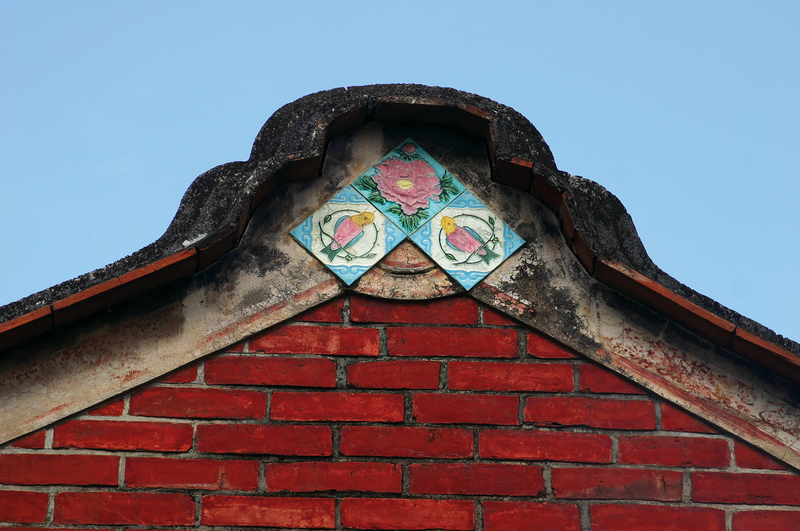 Look up while visiting a traditional Taiwanese san­he­yuan, or courtyard home, and you might see decorative tiles dotting the roof ridge or the walls. These tiles were an ingenious finishing touch added to lovely old Taiwanese buildings, their visual interplay with the ordinary red brick around creating a quiet visual dialogue that becomes louder and more vibrant when their colors catch the light. 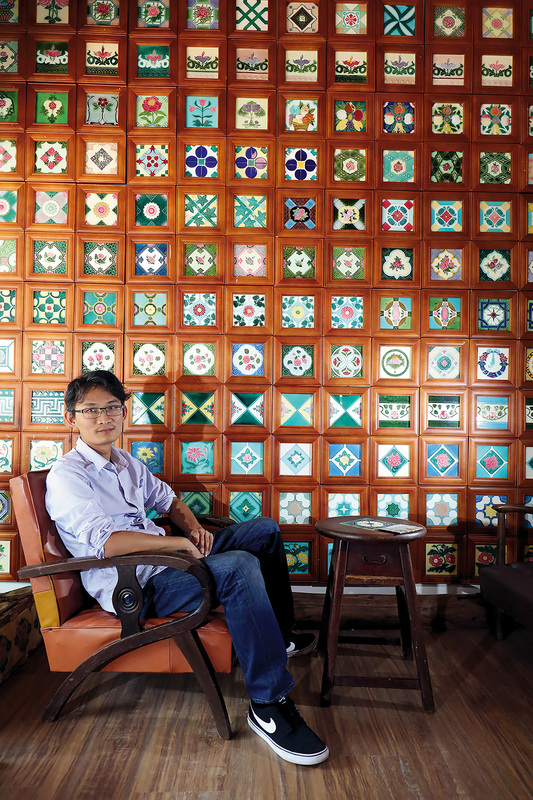 James Hsu, CEO of the Museum of Ancient Taiwan Tiles, started researching decorative tiles while looking for things to chat with his then-girlfriend (now wife) about. Kang Nou­shi studies and documents old buildings, and got involved with decorative tiles after falling in love with the ones adorning the old houses in Shui­tou while visiting Kin­men in 1990. The tiles have since become a lifelong interest of his, too. In fact, decorative tiles of this type have their origins in Western culture. Japan was exposed to painted majolica tiles from Victorian England during the industrialization and modernization that followed its 1868 Meiji Restoration. But while Japan’s earliest painted decorative tiles emulated the imported majolica, the country soon began to produce its own patterns and designs tailored to the tastes of its export markets. For example, the ethnic Chinese market was partial to auspicious plant and animal designs, such as apples (symbolizing peace), peaches (lon­gev­ity), pomegranates (many children), and fish (abundance), along with the propitious mythical beast the qilin, while the Indian market favored images of peacocks and Gane­sha, the elephant-headed god. 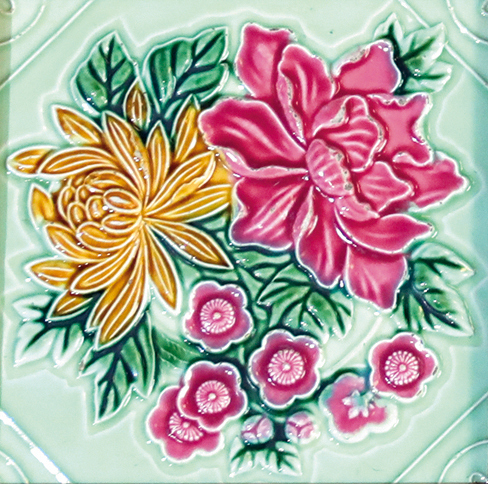 Designs were carved and painted onto six-inch square tiles that were exported to South and Southeast Asia to be incorporated into local construction. As a Japanese colony in those days, Taiwan also received some of these decorative tiles. But they were a costly imported product used only for decorating the exteriors of the homes of the rich, for whom money was no object. The incorporation of these tiles into traditional red-brick san­he­yuan gave rise to a distinctly Taiwanese aesthetic, examples of which include the Tsai home in Bei­gang, Yun­lin County, the Lin home in Wu­feng, Tai­chung, and the ­Huang home in Da’an, Tai­chung. In 2016, France’s Aix-Marseille University encouraged scholars from the UK, Spain, Portugal, Japan, Singa­pore, and Taiwan to jointly apply to UNESCO to have their decorative tile cultures recognized as intangible cultural heritage. Taiwan’s application received favorable treatment in part due to our integration of decorative tiles into red-brick san­he­yuan, a local fusion that dazzled the international community with its uniquely Taiwanese style. But fashions don’t last. 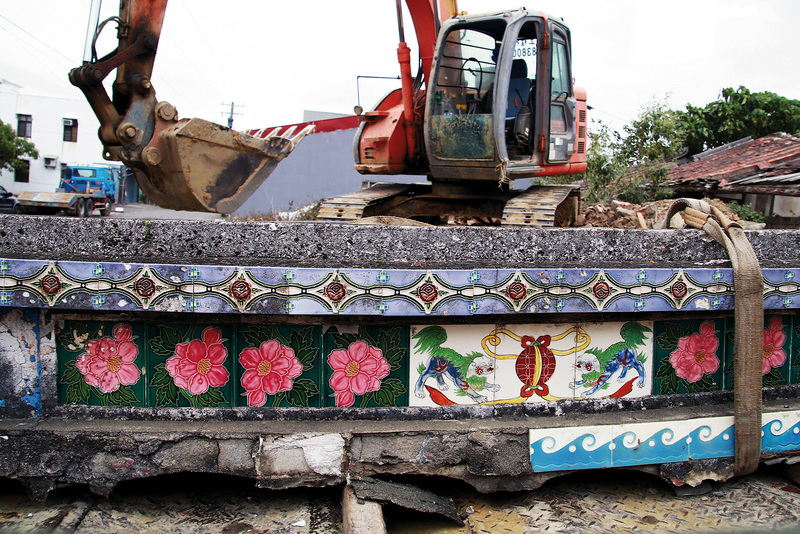 Many of Taiwan’s old tile-­decorated homes have been demolished to make way for reconstruction and urban renewal. Kang Nou­shi took us to see a few of the remaining ones around Greater Tai­pei, including the Guo Ziyi Memorial Hall in ­Neihu, a two-story Western-style structure featuring 12 decorative tiles. We also visited an old house in Lu­zhou, its tree-hidden face covered in decorative tiles, and the columbarium at Bei­tou’s ­Zhonghe Chan Temple, with its unusual peacock and dragon decorated tiles. 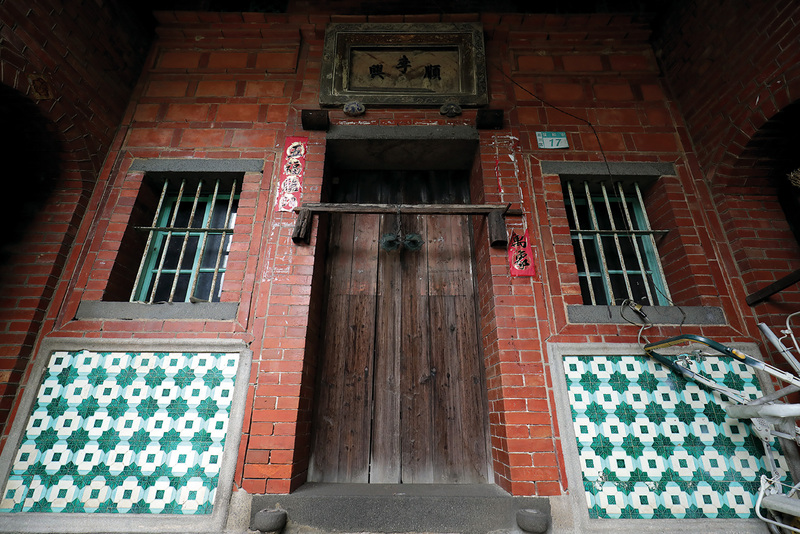 Kinmen enjoys a relative abundance of tile-­decorated buildings, making a sharp contrast with the few ­scattered here and there about Tai­pei. 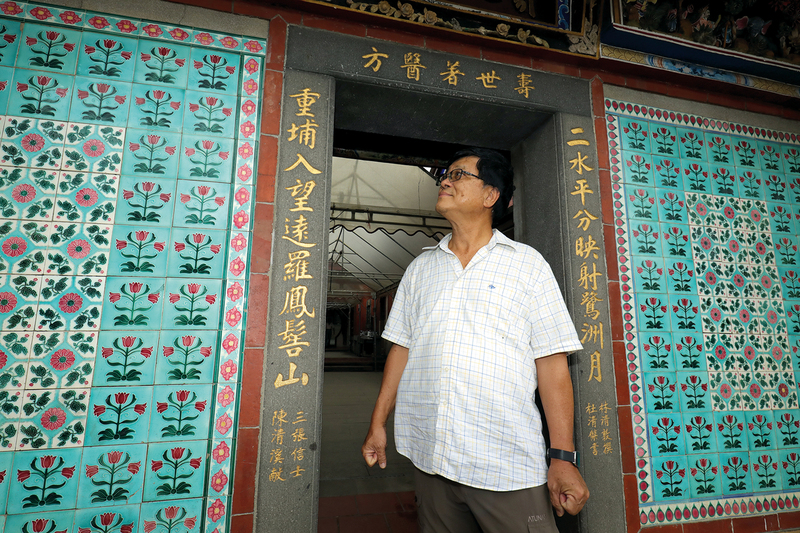 Kang says that the restrictions on construction imposed by the military on Kin­men have made the island a veritable museum of well-preserved tile-decorated houses. In addition to documenting such buildings, some tile enthusiasts negotiate with the owners of buildings that are being torn down for permission to preserve the decorative tiles from the roof ridge and walls. James Hsu, who has been chasing down tile-decorated buildings since his student days, is a case in point. He says that in the old days they just gathered whatever intact tiles they happened to find at demolition sites. Now that they have a little money, they stay in touch with demolition firms that keep them apprised of when tile-decorated homes are slated to be torn down. When they learn of one, they ask the homeowner about preserving the tiles, and, if the owner agrees, use a crane to pluck off pieces of masonry with decorated tiles attached, before the backhoes arrive. Cleaning up the tiles after their removal is a time- consuming affair. They first use an angle grinder to separate the tile from the cement, then deal with any mildew on the tiles. This step is particularly troublesome—they must alternately immerse the tiles in water and chemical cleaners over the course of several days to return them to their former glory. Hsu says that it has taken the group years of experimentation to develop their process for removing mildew, and that they are the only people in Taiwan currently capable of doing so. Hsu and his friends went a step farther in 2015, pooling their resources to buy and renovate a wooden building on Lin­sen West Road in ­Chiayi City. When the renovations were complete, they established the Museum of Ancient Taiwan Tiles at the site to display their decorative tile collections to the public. Manufactured between 1915 and 1935, the decorative tiles in the tile wall at the Museum of Ancient Taiwan Tiles are still dazzling despite their age. Produced and colored by hand, their colors and raised patterns give each tile its own unique look. “One of the unique features of the decorative tiles of this period is their contoured patterning,” explains Hsu, describing the sculptural elements fired atop the tile base. “They used the thickness [of the sculpted elements] to control the colors, meaning that the colors were largely determined by the sculpting. 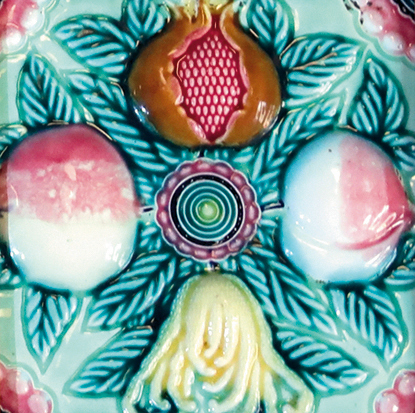 The colors are lighter on the taller parts of the patterns [where there is less glaze], and darker on the lower parts where the glaze tends to pool.” Temperature variations during the firing process also affected the pigments and contributed to the uniqueness of each tile. 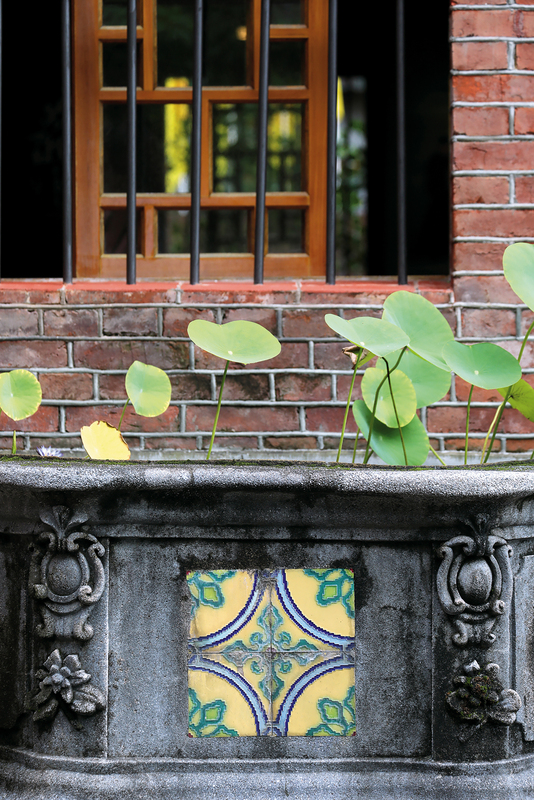 The decorative tiles provide a small glimpse of the architectural beauty of early-20th-century Taiwan. Unfortunately, their production ceased when Japan threw itself into the Pacific War, and market uncertainties and the high cost of making tiles by hand discouraged companies from restarting their production after the war. The museum recently highlighted ten classic decorative tile styles for a crowdfunding campaign. 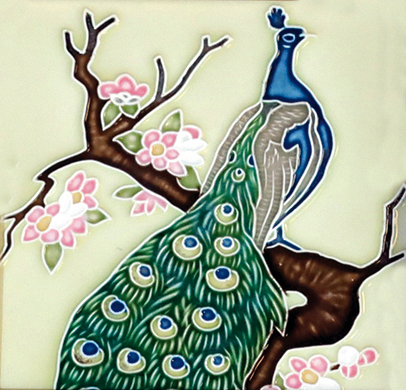 Entitled “Taiwan Decorative Tiles Renaissance,” it aimed to raise money to restart production of the old tiles and reintroduce them to the world. James Hsu says that restarting production is intended to meet the needs of the building preservation and restoration community, which often lacks access to decorative tiles when restoring old buildings. In the past, fellow tile enthusiasts have generously provided tiles from their collections to such restoration efforts because they all agreed that “old decorative tiles should be on old homes.” Recognizing that this wasn’t a sustainable solution, Hsu and his friends decided to start making new tiles themselves. They spent more than a year testing every step of the manufacturing process, from sculpting to mold making, painting, and firing, and didn’t begin raising money until their new tiles were of comparable quality to the old ones. Happily, their crowdfunding campaign reached its goal of NT$150,000 in just 12 hours, and went on to garner more than NT$5 million by the time it concluded in early Novem­ber. 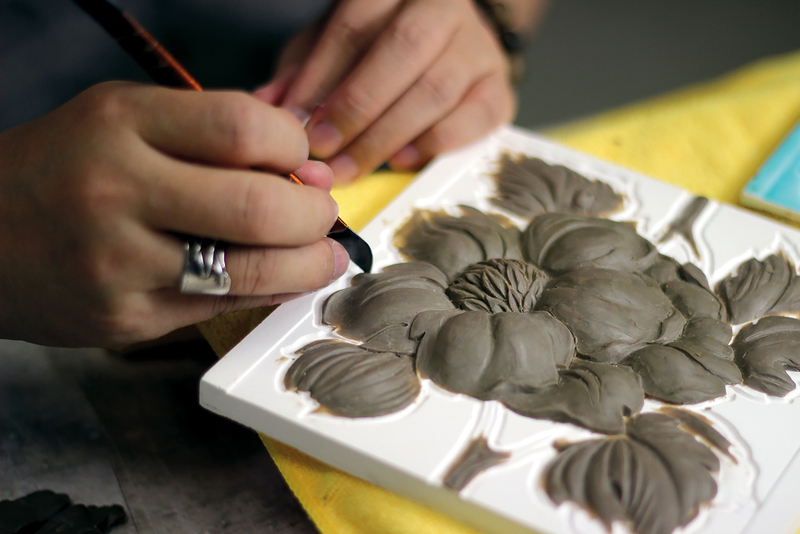 Describing the mu­seum’s plans, Hsu says, “We first emulated the early Japanese imitations of Victorian tiles. Now that we’ve reached the old standards of craftsmanship, we plan to invite Taiwanese artists to design Taiwanese images.” The museum aims to increase public awareness of Taiwan’s wonderful decorative tile culture, while also revitalizing tile production. Its objective is to have tiles once again adorn our cityscapes as a decorative element in Taiwanese homes, and to make decorative tiles a beloved creative gift. “But those goals are far in the future,” exclaims Hsu. Nevertheless, seeing craftspeople sculpting and painting floral patterns into tiles in the video used for the crowdfunding campaign, as well as the public’s generous response, it seems as if decorative tile culture has already begun its new moment in the sun.